In air brake systems, the heart of a proper functioning system is the compressor itself, by which the work of the air compression is done. In designing compressors to perform the work necessary, there are many factors such as compression volume, heat of compression and oil passage. 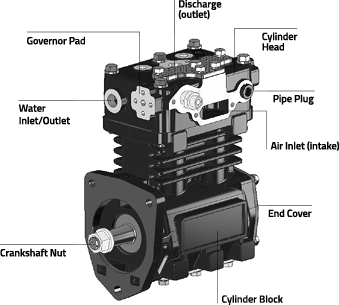 Oil passage is the result of crankcase oil that passes the rings and leaves the compressor with the compressed air. Under normal conditions the amount of oil lost to the air system is minimal. When high enough levels of oil passage (or blowby) occur, it results in “coking” of the valve plate assembly along with contaminating the air system up to the reservoir tanks. Under extreme coking conditions, the discharge line cross-section is reduced enough to restrict the airflow, which results in longer duty cycle times, higher discharge air temperature and further contamination of the air brake system. T/CCI has made great strides in reduction of oil passage by building compressors with tighter piston, bore and ring tolerances that in lab testing, has shown less than 25% of the oil passage from our competitor’s rebuilt product. The reduction in oil passage is in part because new compressors are not subject to the worn cylinders of a used compressor. The choice is clear—use a new compressor that exceeds the standards for performance, durability and oil passage required by the heavy-duty market or suffer the consequences of using a worn out compressor with few new parts added in the rebuilding.